We regularly offer Bronze Medallion and Bronze Cross Challenge Courses. We also Bronze Cross Recertifications. Bronze Medallion teaches an understanding of the lifesaving principles embodied in the four components of water-rescue education: judgment, knowledge, skill and fitness. Rescuers learn tows and carries, and defense methods and releases in preparation for challenging rescues of increased risk involving conscious and unconscious victims of various types. 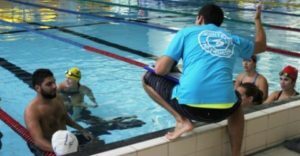 Bronze Cross is designed for lifesavers who want the challenge of more advanced training including an introduction to safe supervision in aquatic facilities. Bronze Cross is a prerequisite for all advanced training programs including National Lifeguard and Lifesaving Instructor certification. It includes a timed 600-metre swim. Emergency First Aid is also included. Prerequisites for Bronze Medallion: Age 13, or Bronze Star. Prerequisites for Bronze Cross: Bronze Medallion. Sundays, June 2, 9, 16, 8:30-4:30. Location: Cindy Klassen Rec Complex, 999 Sargent Ave., Winnipeg. This class is cancelled. Our Bronze classes are capped at 5 students and we also include Emergency First Aid. Most other organizations can have up to 12 students. This does not include the text ‘Canadian Lifesaving Manual’ ($49). This does not include the cost of pool admissions.